Pets chew for various reasons: teething, exploration, separation anxiety, boredom and stress. Chewing is a natural animal behavior, so the goal is to effectively train your pet to chew on appropriate objects. be sure your pet has appropriate chewing toys. 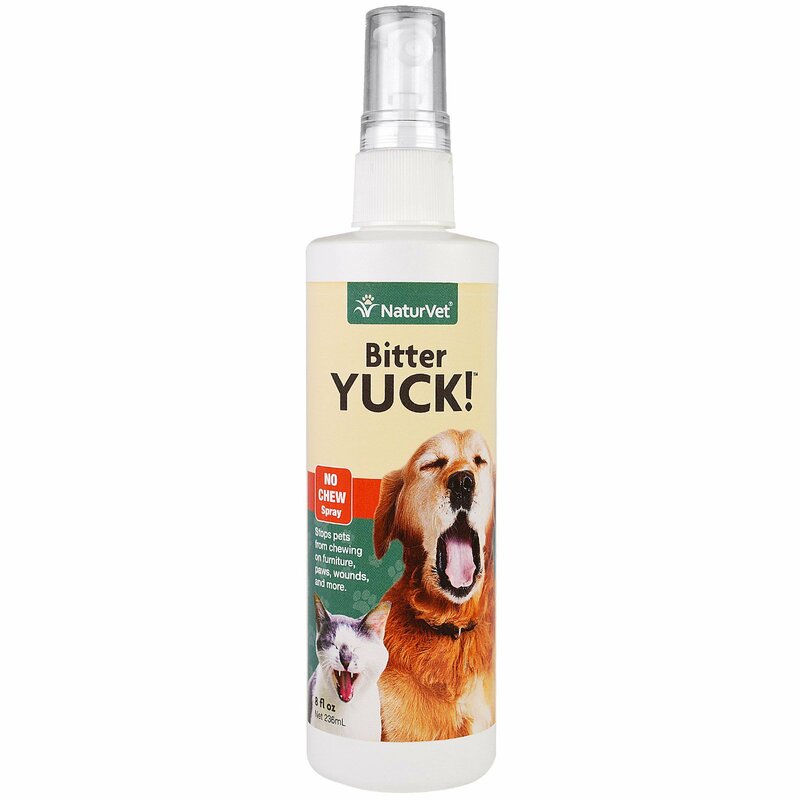 To most pets, Bitter Yuck! has an unappealing taste, making chewing on the particular sprayed object unpleasant and decreasing the unwanted behavior. Due to the complexities of taste preferences and behavior issues, results may vary. It is important to monitor your pet's reaction to Bitter Yuck!. Be sure your pet is deterred by the taste before leaving them alone with the object being sprayed. Spray Butter Yuck! evenly on hot spots, summer itch, furniture, etc. Use consistently until undesirable habits are curtailed. Do not spray around eyes or nose. الماء منزوع الأيونات، وكيل المريرة، وحامض الستريك. This product is designed to be non-staining; however, before using this product test on a small inconspicuous area of the surface. Keep out of the reach of children. Avoid contact with eyes. In case of allergic reaction or accidental ingestion consult a health professional immediately. Alcohol free will not sting. Bitter YUCK! is a training aid, but occasionally a few pets are very persistent due to their natural instinct to chew. Garmon Corporation / distributors / dealers are not accountable for damages to furniture or fixtures created by product use or pet, either in part or full.